Early reviews and hands-on impressions of the new iPad mini came out today. 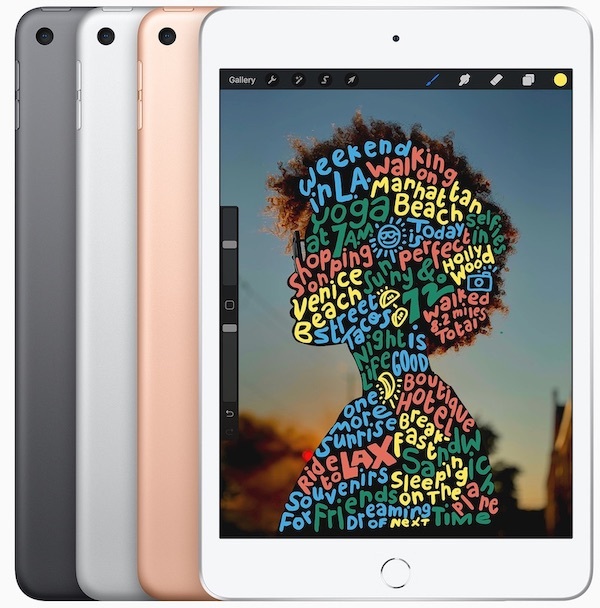 Most publications agree that the iPad mini is a great update for fans of the smaller 7.9-inch tablet with almost identical tech specs to the new iPad Air. That includes the same A12 Bionic chip, 8-megapixel rear camera, 7-megapixel front camera, Touch ID, Lightning connector, 64GB and 256GB storage options, two speakers, headphone jack, Gigabit-class LTE, first-generation Apple Pencil compatibility, and up to 10 hours of battery life. The new iPad mini's only notable differences versus the new iPad Air are its smaller screen and lack of Smart Keyboard compatibility. You're still looking at the exact same external design, which is now nearly seven years old. If you secretly replaced any previous iPad mini with the new one, there's a chance you might not even notice the difference. All the changes to this new mini are on the inside, and they're significant — which they should be, given the amount of time since it was last refreshed. …the iPad Pro came out late last year with a new second-gen pencil that magnetically clips onto the side of the iPad and charges wirelessly, but this new mini doesn’t have any of that. Instead, you’ve got Apple’s first-gen Pencil, which has never been a triumph of design or usability. You still pair and charge it by plugging it into the bottom of the iPad, which looks even more ridiculous on the mini, and the cap is still insanely easy to lose. As for the iPad mini sticking with the Lightning connector, Apple told Patel that it views USB-C as a "pro" feature — aka iPad Pro. Patel added that "the display is very nice" on the new iPad mini despite not having the iPad Pro's ProMotion variable refresh rate for smooth scrolling, but found that its same old 8-megapixel rear camera "takes at best medium-good photos." Most reviews conclude that if you want the smallest iPad possible, the new iPad mini is quite capable and at least somewhat reasonably priced at $399. And with little competition from Android tablets, the iPad mini is one of the only small tablets worthy of consideration in the first place. I haven't fallen in love with the new Mini, just as I never felt the need to buy one before. But I could see why people would. It's less burdensome than a lot of other things we carry. It's not quite pocketable, but it's close. Again, I can't hold it in one hand, but some people can, I'm sure. The Mini feels personal in a way that other devices no longer do. Not because of its actual newness, but because it is still here, and slightly reinvented once again. I'd actually argue it's perhaps the best small tablet out there right now. There's more than enough power here for most people, and if portability is your biggest concern, there's no denying the mini is more convenient to lug around. The new iPad mini can be ordered now on Apple.com and will be available in Apple Stores starting next week. There is no way of getting around how bad those top and bottom bezels with the off-center Home Button look, especially when you compare it to the iPad Air. I honestly couldnt care less if this thing looked like frankensteins neck. The ability to sketch and take accurate, legible notes on a device that is large enough to see what youre doing, but small enough to always be with you, makes this the greatest thing Apple has ever made. If I were to give a damn about what it looks like, I’d still say bezel symmetry doesn’t matter as much on the mini, because unlike the full size ipads youre comparing it to, this is actually capable and useful as a mobile device, and youre going to want a silicone back on it. As soon as you put that on, which curls around the front edge, you ruin the symmetry anyway. One can dream of a world where the device has a perfect Apple-produced silicon back, and the button is centered in the remaining space, but then we waited 4 years for this much, lets not make it 8 by trying to add cuteness. And as a mobile device, USB-C currently means you cant scrounge a charge from anywhere out on the road unless you happen to have your C charger assembly along with you. You can find cords with lightning ends everywhere. ...and they all have USB-A ends, that work in every coffee bar and airport and university hotspot and car stereo everywhere. With the inexplicable decision of “lets wait 4 years to update and then update it with a 4 year old Apple Pencil” being an odd exception, this is the perfect ipad for “right now”. Maybe in a couple years when apple fixes their multitasking/gesture mess they can do away with the home button. ...and then we can probably kiss using our favorite headphones goodbye too. I sort of get the complaints about the exterior design but at the same time, what’s wrong with it. The fact is has bezels isn’t wrong. That’s more of a fad than a defining characteristic of usability. Face ID would have been nice but Touch ID works fine. If I hadn’t gotten the 10.5” pro last year this updated mini is what I would have gotten. I’m glad Apple finally updated the Mini. Hope they keep it up. I don't think so. Every other iPad since the original (except mini 4) had a perfectly centered Home Button, if you take an external aluminum frame into account. “Look at the off-center home button”, Or “What, no USB-C?”, ect, ect, ect, ect. Clearly Apple can never do anything right, at least according to the Macumors rhetoric. + u get the bigger bezels. Oh, for Pete's sake, you are really just complaining for complaining sake, aren't you. The bezels have exactly the same dimensions than in the previous iPad mini version, which - as I have to remind you - has been released about four years ago. And the Home button has always been off center on the iPad, since the very first iPad nine years ago. If that isn't the case with current Air, it is the exception of the rule. I'm a fan of the mini. Not too big, not too small. Perfect size. It's the "best" iPad Apple makes (for a lot of tasks). Product release this week have just confused the market and buyers more. What a weird line up of features.